*Merry (belated) Christmas, friends. We have been soaking up the joy of this season and enjoying the slower post-Christmas pace. While we couldn't send this card and letter in the mail to all of you who read Short Stop, I wanted to share it with you here today. Thank you for reading, sharing in my joys and struggles, and for sending such encouraging words all year long. When we run to the mailbox each day during this season, open up the envelopes and pull out the Christmas cards from the families we love, I (Sarah) always sit and imagine what the real story is behind the photos. Because if we’re honest, isn’t there always a story there? And, so – in writing our Christmas letter, I’ve now used the word “poop” three times. Jason approved this message, which means both of us have given in to the madness. Alas, poop talk (again? ), photo op bribes, squirmy and impatient littles, and crazy, chaotic mayhem make up our days. But, our fab five? Man, do we love ‘em. As we look back on this last year full of moments like these, we are truly thankful. God gave us a special kind of joy this year in the birth of our daughter, Holland Annabelle, on December 27th. The boys welcomed and loved her into our family in ways that have been an absolute joy to witness. These children are God’s best gifts to us. I could tell you of our kids’ accomplishments - the things that have caused us to praise them for working so hard at something. Or of Jason’s job successes or how I’m finding my way as a mother of five. But, I won’t. Because those things, while valuable and worthy, aren’t what cause us to look back on this year with joyful hearts full of thanksgiving. It is in our failures and struggles, pain and losses, fears and disappointments – that this time of year means so much to us. It’s in our fumbling pursuit of love in our marriage and as parents that Jason and I (sometimes embarrassingly) get to show our kids how much we need a Savior. And, that while extending grace and forgiveness isn’t always easy, it is ALWAYS worth it when you’re little. Just like it is when you’re big. And, as we’ve watched our precious children fall and then get up, again and again - we get to point them to a manger and a cross and show them that nothing they do could earn our or God’s approval, but that we are loved because of what Jesus has already done for us. As we celebrate another Christmas and start a new year, we are thinking of all of you: our dear family and treasured friends - near and far. Whether this past year has brought you pain or joy, failure or success - or like us, that beautiful mixture of both - we are so thankful for you and it is our joy to walk through life with you. But, most of all, we are thankful for Jesus, the One who is always with us - in all things and in every season - Who came to give His life just to know and love us. 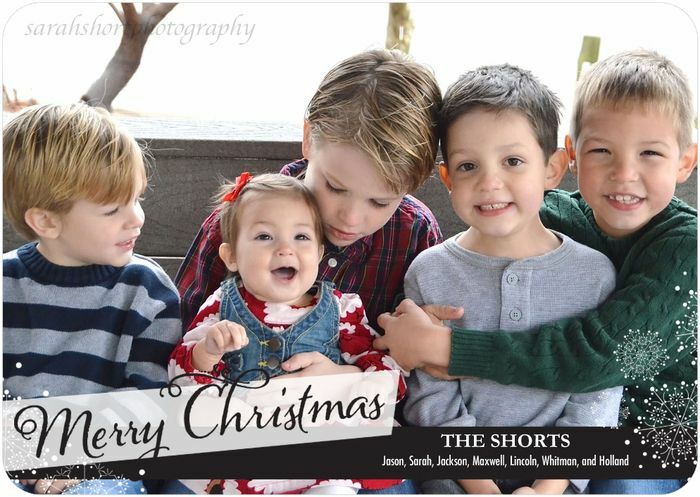 What a GREAT Christmas card and a beautiful Short Family update to go with it. God bless your family in the coming year! Those little faces are so precious! Thank you for sharing your ups and downs and for again pointing us to the One who holds us in the palm of His hand. Beautiful letter, Sarah. Thank you for sharing it!!! I love reading your blog. While I am currently a mother of only two boys (it SERIOUSLY seems like there's 8 of them)…your words speak to my heart. I blog, but really just share my heart and my goals and where our family has been and where we want to go. Thanks for being true to yourself and sharing your squishy babies and crazy life with anonymous people like me. :) Have an exciting and unforgettable 2014! Sarah, I love how steadfast you are in Christ. Thank you for being His witness in all things. Praise God, and may He bless you and your sweet family.